I’ve had turkeys on my mind a lot lately. About a week ago, I picked up our turkey poults from the post office. After the success of last year, we decided to increase the number of turkeys we raise and got 15. 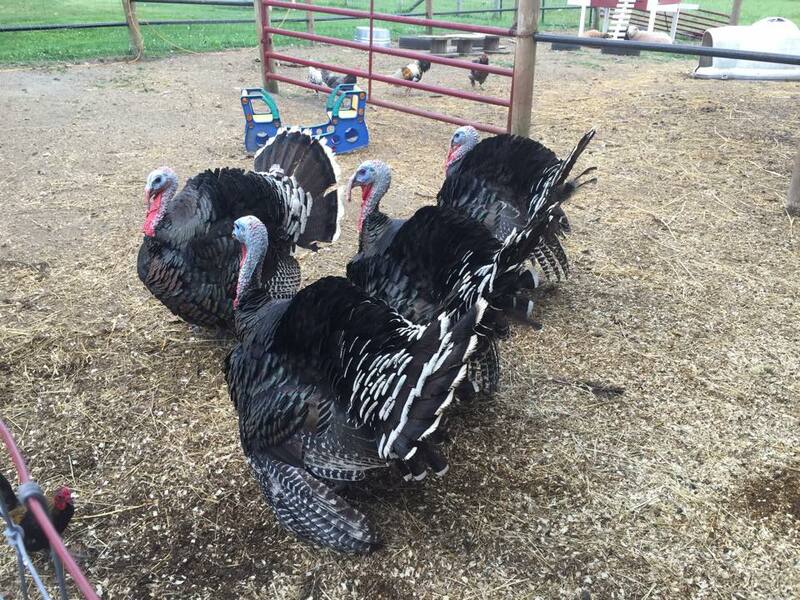 We bought 10 bronze breasted bronze turkeys, which are the same kind we raised last year. Broad breasted bronze turkeys were specifically bred to grow very large quickly. We waited a little too long to process them last year – several of our toms were >40 pounds dressed! Because of their size, bronze turkeys reproduce poorly. In fact, hatcheries have to use artificial insemination to maintain the line. Now that’s a dirty job! 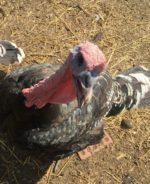 I’m interested in raising turkeys that still possess some natural qualities, so we are also trying out 5 Bourbon Red turkeys. Bourbon reds have a lot of breast meat and a deep rich flavor, but they are still able to reproduce naturally. The turkeys we are raising for meat aren’t the only turkeys on my mind, however. You see, we may have accidentally domesticated a wild turkey. About a year ago a female turkey started showing up in our pasture, then in our corral, and before we knew it, she moved in completely. She roosts in our barn at night, eats out of our chicken feeders and fights the roosters for scratch. I was even able to pet her the other night. We call her Samantha. Samantha eating with our chickens. Turkey hunting season starts tomorrow and even though Samantha is a bit on the lean side, she has a beard. A turkey beard is a stiff feather that becomes bristly and hangs down the front of the turkey. 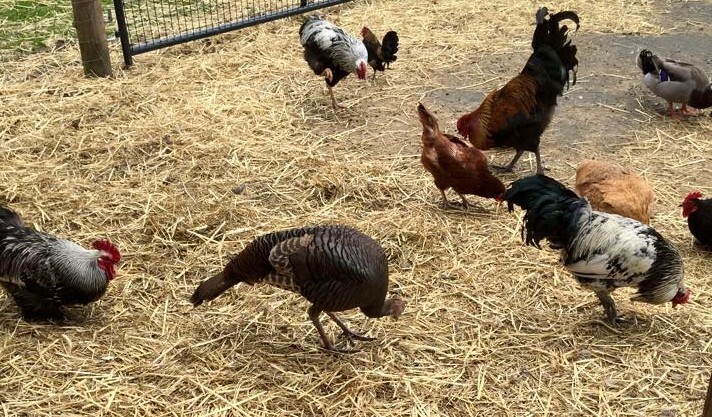 All toms grow beards while only 10-20% of female turkeys grow a beard. In Massachusetts, you can only hunt bearded turkeys in the spring – this makes Samantha a prime target. I hope we haven’t made her too familiar with humans.